Whether you’re enjoying an outdoor concert under the starry night sky or the gently sloping lawn at a sunny afternoon festival, our A&B Amphitheater is an ideal, yet intimate space for concerts, events and theme parties. This venue is flexible and can be arranged with chair seating, table seating, standing room only, bleachers or a relaxed setting with beach chairs and blankets. It has been host to such big-name talent as: Elton John, Jimmy Buffett, The Doobie Brothers, the Eagles, the Who, Sting, Bob Dylan, Earth Wind & Fire, Santana, Pearl Jam, Bonnie Raitt, B.B. King, Ziggy Marley, Prince, and many other renowned entertainers. 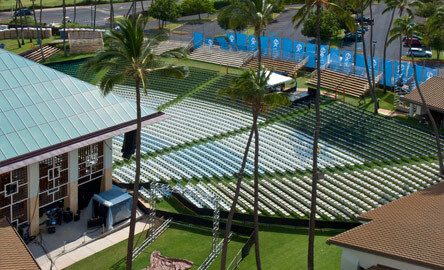 MACC also uses this venue for its signature fundraiser events, Maui Calls, and Maui Brewers Festival. Capped by a translucent skylight roof made from 288 glass panels, which glow like the setting sun when lit at night and reach to a 50-foot apex, the Pavilion offers ample space for a wide variety of occasions and uses - bring us your imagination and we’ll create your ideal event. 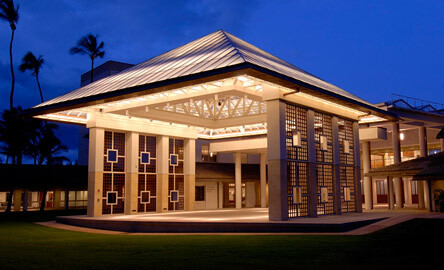 With textured concrete flooring framed by stately columns clad in Travertine tile, the Pavilion can easily be enclosed with decorative wood grills made from African mahogany. These panels fit between the columns and are raised or lowered for privacy and comfort, providing 4,096 square feet of interior function space. Expansive roll-drops are available for backdrop and projection use. There are no dressing rooms specifically dedicated to the Yokouchi Pavilion venue but the backstage Castle Theater dressings rooms usually suffice nicely. The Haynes Meeting room is another nearby option. The Center has a variety of mobile decks that can be assembled at various heights to accommodate the size and needs of the performance. The size of the stage is dependent upon the needs of the event. 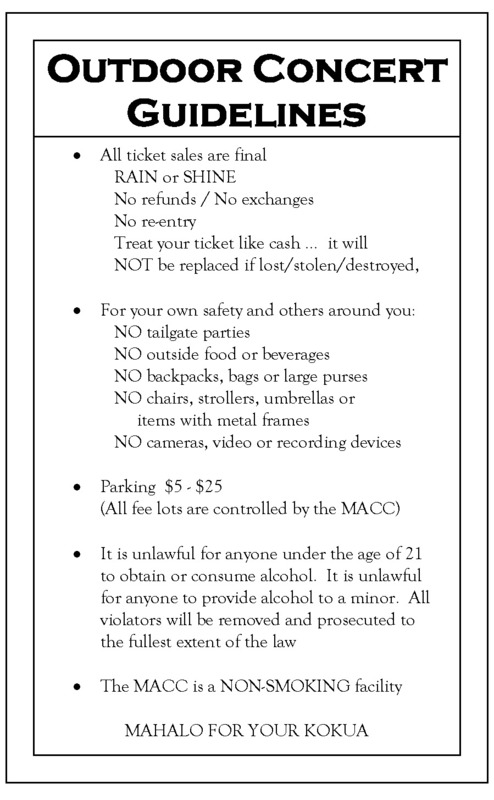 The area for audio and lighting consoles for shows facing the A&B Amphitheater is located on the lawn approximately 100’ from the concrete pad of the Pavilion. The flush concrete hatch in the lawn at this location is access for cable runs to the stage. If the event is facing inward towards the Courtyard, FOH is typically located about 75’ from the stage near an access panel that provides connections to audio, lighting and power. It is slightly off-center house right.